What is the position of Srimati Radharani? We should try to understand this today and offer our obeisances to Radharani. "Radhe vrndavanesvari:"
Our business is to pray, "Radharani, You are so dear to Krishna. So we offer our respectful obeisances unto You:"
If you go by the speculative process to understand Krishna, it will take many, many lives. But if you take to devotional service and you just try to please Radharani, then Krishna will be gotten very easily, because Radharani can deliver Krishna. She is such a great devotee, the emblem of maha-bhagavata (topmost level of devotion to Krishna). Even Krishna Himself, though He says vedaham samatitani ("I know everything") cannot understand Radharani's quality. Radharani is so great. 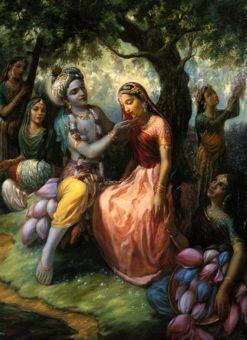 Actually, Krishna knows everything, and in order to understand Radharani, Krishna accepts the position of Radharani in order to understand Her potency. Krishna thought, "I am full. I am complete in every respect, but still I want to understand Radharani. Why?" This propensity made Krishna obliged to accept the propensities of Radharani, to understand Krishna, Himself. These are, of course, very transcendental topics. It is a great science. Only one who is advanced in Krishna consciousness and well conversant with the shastras can understand such things. But still, we can discuss from the shastra (scriptures). When Krishna wanted to understand Himself, He adopted the tendency of Srimati Radharani. And that is Chaitanya Mahaprabhu. Radha-bhava-dyuti-suvalitam: Chaitanya Mahaprabhu is Krishna, but He has accepted the propensities of Radharani. As Radharani is always feeling separation from Krishna, similarly, in the position of Radharani, Lord Chaitanya was feeling separation from Krishna. That is the teaching of Lord Chaitanya - feelings of separation, not meeting. The process of devotional service taught by Chaitanya Mahaprabhu and His disciplic succession is how to feel separation from Krishna. And that is Radharani's position: always feeling that separation.